WORDS OF COMFORT: Pastor Paul Hudson speaks to mourners, including Opposition Leader and Siparia MP Kamla Persad-Bissessar, at the funeral for couple Khemchan Roopnarine and Patricia Ali who were killed in a hit-and-run accident on Sunday. Orphaned siblings nine-year-old Brandon and five-year-old Darrion Roopnarine appeared to be in a daze as they placed flowers in the coffins of their parents who were killed in a hit-and-run accident on Sunday. Relatives carried the siblings in their arms during the funeral yesterday for 38-year-old Khemchan “Darren” Roopnarine and 36-year-old wife Patricia “Cindy” Ali. Even a member of the Police Service’s Victim Support Unit held Darrion as he placed flowers in his parents’ coffins. Hundreds of mourners flocked to the family’s home at Penal Rock Road, Aquart Village in Penal to bid farewell. Among them were Opposition Leader and MP for the area Kamla Persad-Bissessar. Addressing the bereaved, Persad-Bissessar referred to the African proverb - It takes a whole village to raise a child - to call on the congregation to do so. Saying it was a sad time, she added there is very little one can say. Tragedy struck shortly after 10pm on Sunday when the Roopnarine, Ali and their sons were returning home from a family lime a few houses away. 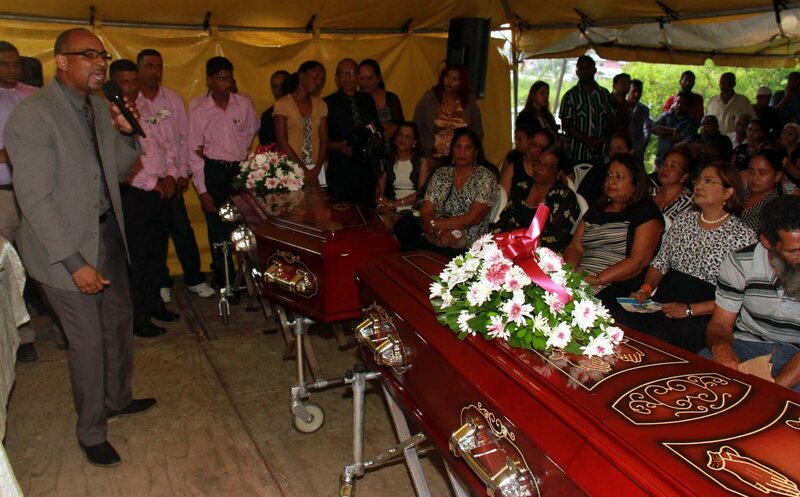 While walking on the Penal Rock Road, a car slammed in the couple killing them instantly. The children, who were a short distance ahead, escaped injury. The driver never stopped. Roopnarine was a construction worker and Ali a domestic worker. Delivering the eulogy, Roopnarine’s cousin Richard Jaipersad said the couple had a unique relationship. “Cindy had a passion for cooking and Darren had an appetite. He liked his belly. He told me some time ago, whenever he passed away, once he passed with his belly full he happy to go,” Jaipersad said. He described Roopnarine as a man who liked “to kicks” but never liked a Monday. Pastor Paul Hudson said in the midst of pain, people tend to question God. “I want you to know that he cares for you. Jesus will bring peace to our hearts if you put trust in Him. To the sons, God knows you. God is going to take you through this season of sadness.” The bodies were buried at the Batchyia Public Cemetery, Penal. After the accident, police detained a woman who has since been released. Reply to "Village urged to raise orphaned siblings"